Divide pumpkin, kumara, carrots, capsicum and onion between trays. Brush with oil; sprinkle with sea salt. Roast for 25-30 minutes or until tender and golden. Roast tomatoes and asparagus on separate tray for 10 minutes until tender. Whisk garlic, mustard and vinegar in a small bowl. Gradually whisk in oil. Season to taste. 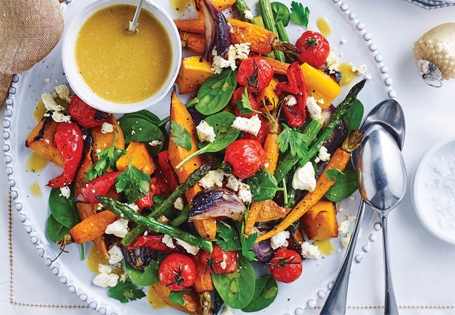 Layer spinach, vegetables, fetta and parsley on a serving platter; drizzle with dressing before serving.